Description : It is made by handmade Leather . We stamped designs on leather. It is 100% Hand made Leather. It is stamped design on the Leather. It has three portion inside. It is available in diffirent design and color also. 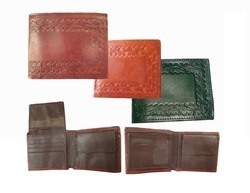 Looking for Handmade Leather Men Wallet ?